'DERBY HORSE RACING GAME OF CHANCE' GAME. The game is in very good condition indeed for its age. The cardboard board, which shows signs of storage wear, remains strong and sturdy and is each corner is fully intact without any use of sellotape. 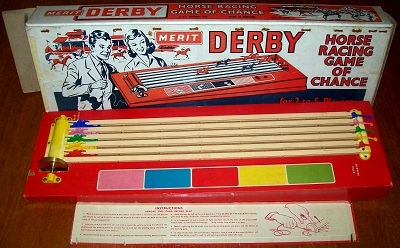 The game itself presents itself in lovely condition: the winding mechanism (the pull-cord for which has long since gone, but is easily replaceable with a simple piece of string) is in perfect working order; the game box is clean and solid; and each and every horse and winning posts are in their original, unbroken condition. Quite amazingly, the game also benefits from having its original cardboard rule insert. This really is an excellent example of a game that is becoming very difficult indeed to find in this sort of condition. For 2 - 5 players.